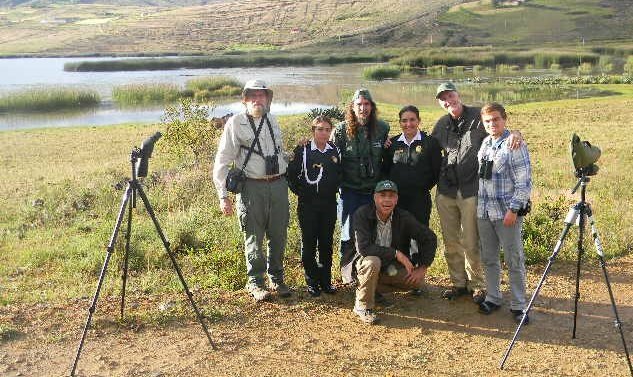 I thought I would talk about our team’s performance in the World Birding Rally Challenge in Northern Peru and the side attractions along the route. Then, I saw Hugh Powell’s superb post. I thought of maybe topping Hugh’s “Be Careful What You Wish For: A Punter’s Guide To The World Birding Rally” post, but I quickly realize, there is no way I could even come close to match the depth and writing quality of his post. Hugh made things easier on me, as now I will only talk about other nature and cultural sites along the route covered in the Northern Peru World Birding Rally Challenge. This is the third time I participate in a Birding Rally Challenge in Peru and still can’t decide which of the Rallies was the most enjoyable. Some may say that competitive birding has little to do with enjoyable birding. Indeed, the nature of the competition leads to a fast pace, non-stop birding from dawn to dusk without much time to observe birds in detail. Needless to say this birding style does not allow time to stop at other nature and cultural sites along the way. Some of my team member have varying degrees of birding experience in Peru and were visiting the endemic rich northern Peru for the first time. It was painful to leave a site after catching glimpses or checking birds by sound, most of which were lifers. We had to move onto the next site to keep ourselves in the race. Outside a birding race, the northern Peru birding route is, in my opinion, the most enjoyable of all birding routes in the country. The sheer amount of bird species and diverse habitat types would be enough of a draw for birders and naturalists. 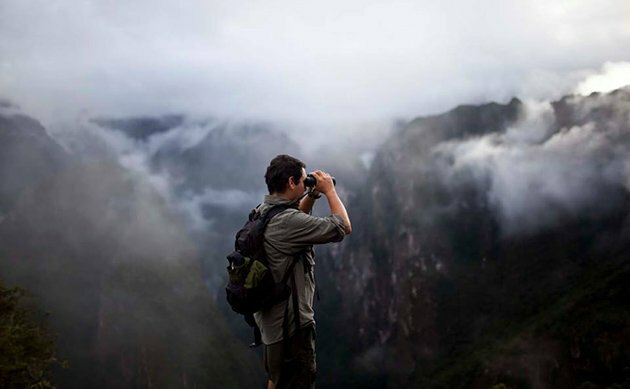 For those who also enjoy stopping at cultural and scenic sites, the northern Peru route is the one to bird. And why not adding other elements to your birding experience if you are visiting a foreign destination and these “side sites” are of easy access. 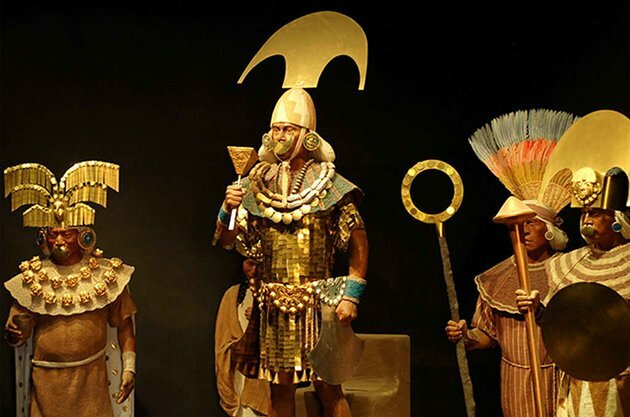 The Lord of Sipan and Royal Officials featured in the Chiclayo History Museum. With some planning, one can bird from dawn to mid-day, visit cultural sites in part of the early afternoon, and resume birding in the late afternoon. These cultural site are minor detours from the birding routes, most of which take about 30 minute drives from the birding route. 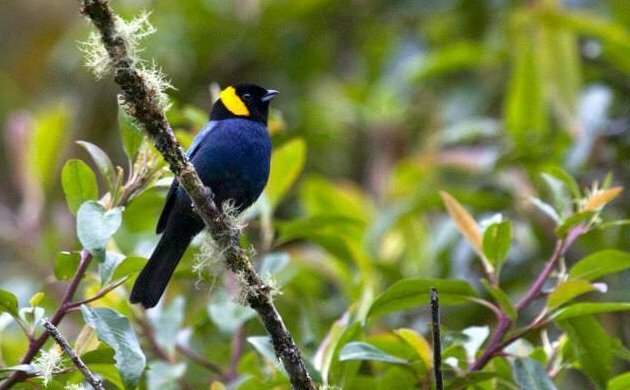 Starting in the western lowlands one could visit the Tumbesian endemic bird-rich Bosque Pomac. Scattered archeological sites are located right outside the limits of this conservation area. These sites and the great museum in the City of Chiclayo can be visited early in the afternoon when the bird activity is the least due to the equatorial heat. Further up, the city of Cajamarca boasts colonial churches and Peru’s largest hot springs. The Andean arid scrub along the Chonta Canyon is the best site for the poorly known and range-restricted Gray-bellied Comet and it is located within approximately 30 minutes from the city. After a long day of birding, soaking in the hot springs as the Inca royalty once did, and a visit to local churches may be a good way to end the day. The Maranon Valley represents a formidable geographic barrier in the distribution of some Andean birds. 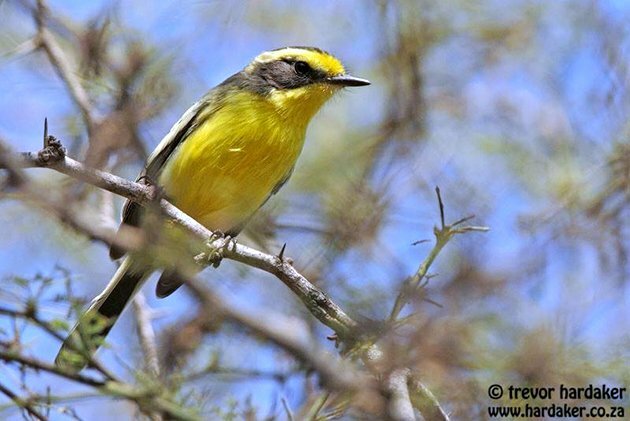 The arid valley itself harbors some of the most range-restricted endemic birds of the region. The scenic beauty of the place warrants multiple stops to look for birds and enjoys the vistas. Sarcophagi perched on vertical cliffs in the Utcubamba Canyon. Further east, the road enters the Utcubamba Canyon where Maranon Thrushes and Peruvian Pigeons perch near sophisticated burial sites perched on vertical cliffs. The Kuelap Citadel is considered the Machu Picchu of Northern Peru. Its strategic location affords breathtaking views of the deep valleys. Birding along the allies and amphitheaters of Kuelap can be rewarding as most of the vegetative cover that once overtook the place has been preserved and is now managed. This detour will take a whole afternoon. 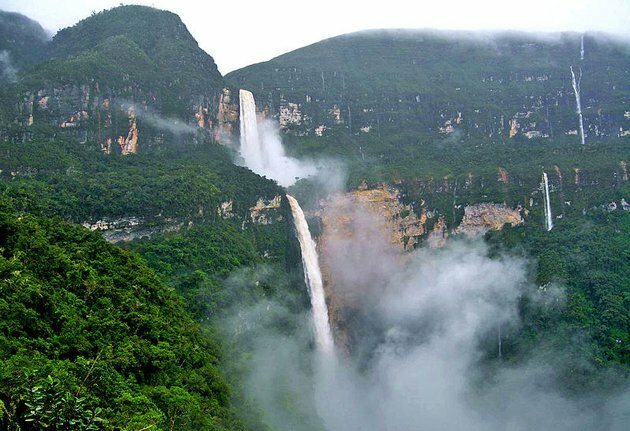 Deeper in the canyon lays the Gocta Falls considered the world’s third tallest waterfall. Access to the base of the waterfall may take a few hours, but the trail feature portions of pristine humid montane forest where birding is great in the early morning hours. Gocta Falls. Photo: Wikipedia/Elemaki/Creative Commons. There are multiple archeological sites and local museums that can be visited on a roadside stop. 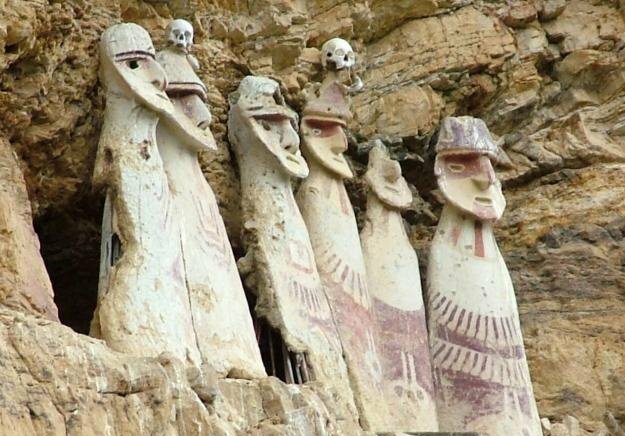 The Leimebamba Museum comes to mind. Here the superb museum is located within walking distance of hummingbird feeders where Rainbow Starfrontlets, Little Woodstars, Marvelous Spatuletails, and Purple-throated Sunangels are regulars. 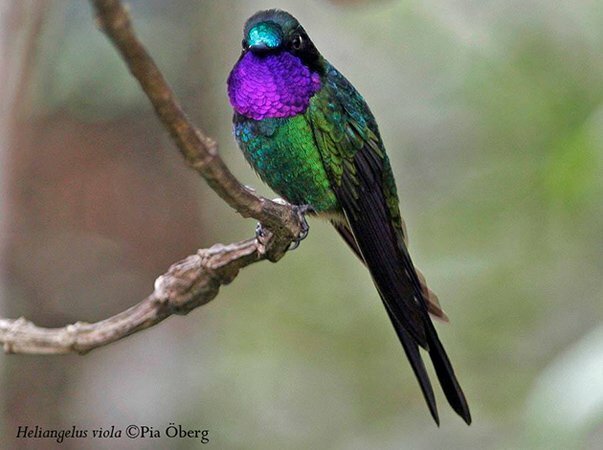 Purple-throated Sunangel. Photo: Pia Oberg. Our team left it all on the birding trails, but fell short. I congratulate the Wings/Sunbird team for a well-deserved win. I also congratulate the event organizers, particularly Manuel Bryce, for envisioning and executing a plan to promote bird conservation through ecotourism in one of the world’s best birding hot-spots. Surbound Team. From left to right, Tim Towles, David Simpson, Adam Kent, Diego Garcia-Olaechea and Alfredo Begazo (knelling). The two unidentified police women graciously posed for a group photo. 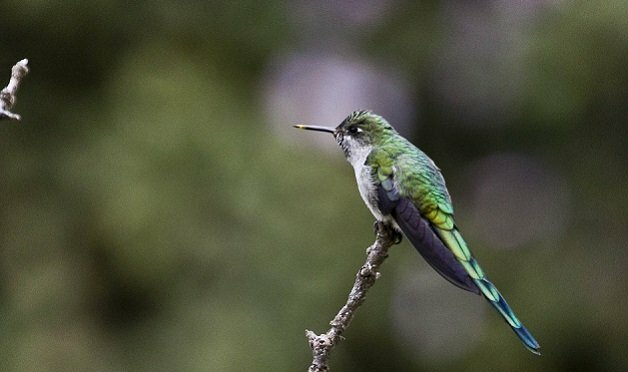 As these type of events occur, more and more family operated lodges, hummingbird feeders, and private conservation areas continue to appear along the Northern Peru Route. I believe the local people, bird habitat conservation and the birds we love are the ultimate winners of these events. Featured Photo: Dennis Osorio, head of support team. It sounds a fascinating area and thanks for posting about it. Glad you like the post Sonja, and thanks for stopping by.